Healthy New Year resolutions and fitness – don’t forget your protein! It’s nearly New Year’s Eve, that traditional time when everyone starts thinking about their resolutions and goals for next year. Health and fitness is always high up on the list, but every year I see people embark on a ‘healthy’ diet and forget about one of the most important parts. Protein – here’s why you need it, whether vegan, vegetarian or not. Many of us have done it – full of good intentions we start eating healthily on January 1st after the Christmas excesses, only to be faint by the end of the week and craving every chocolate and treat in existence because you’ve only eaten salad. Or the initial much celebrated weight loss or muscle gain stalls at the end of the month and you fall off the fitness wagon. It won’t cure lack of motivation, drive or willpower but protein is an absolutely essential part of any diet, and you need to know what it does. Keeps you fuller for longer. When it comes to feeling full, clinical studies* consistently showed that high-protein diets increase the feeling of fullness, and decrease hunger compared with high-fat or high-carbohydrate diets. Helps repair your body’s cells (every cell in the body needs it), minimising soreness after workouts, and builds lean muscle. There are many vegetarian and vegan proteins available. Along with fat and carbohydrates, protein is a “macronutrient” meaning that the body needs relatively large amounts of it. Unlike fat and carbohydrates, the body does not store protein so needs it regularly. You will not gain muscle and become ‘bulky’ just by eating protein. You can only digest a certain amount of protein at a time, and the body doesn’t store it, so eating more and more isn’t a fitness solution! Extra protein doesn’t mean extra strength, but it’s essential for repairing and building those muscles afterwards. Don’t shun fats and carbs either, they’re all essential and the myth of fat being exclusively bad for you is a long-running one. Healthy fats are needed by your body for many functions, avocado be praised! Beans: Beans contain more protein than any other vegetable protein. Plus, they’re loaded with fibre that helps you feel full for longer. Nuts: One ounce of almonds has 6 grams of protein, and they’re also a healthy fat source. Whole grains: A slice of wholemeal (or wholegrain seeded) bread gives you 3-10 grams of protein, plus valuable fibre. Brown rice is also good and mixes easily with salads, veg and stir fries. Fish: Fish offers heart-healthy omega-3 fatty acids and, in general, less fat than meat. Poultry: You can remove most of the saturated fat by taking off the skin. Protein smoothie – That Protein with soy milk or water – you can add fruit like fresh raspberries, half a banana, plus additional nutrients like Chia seeds and Aduna Baobab fruit powder. Quorn vegetarian sausages or hotdogs in a bun, with fresh ketchup – simple and easy classic! Here at Ethical Superstore we have some fantastic brands of high-quality protein like Good Hemp, That Protein and Creative Nature. They have none of the bloating often associated with whey protein, which I can attest to. 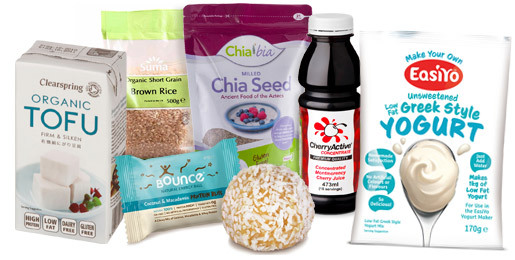 We also have great snacks/treats courtesy of Bounce – tasty protein balls that are perfect for a healthier snack or protein boost on the go. I still have no idea what you’re on about! Don’t worry about it if you’re just getting into fitness, or a vegetarian or vegan diet – specifics can come later, but just remember that protein is a building block you need, and that it’s a great way to keep healthy and stay full for longer. You don’t have to count calories or ‘macros’ if you don’t want to. If you have any specific questions, or even tips on favourite meals, let us know! * Clinical studies: WebMD specifies Frank Hu, MD, PhD, assistant professor at Department of Nutrition at Harvard University School of Public Health in Boston. Previous story Why should you try green tea?